Please note L’oreal has changed the name. Powercell Repair with Lactic Acid is a single-dose repairing treatment for very damaged hair. To be used after shampooing as an instant repairing treatment for fragile, brittle, sensitised and devitalised, lifeless hair. 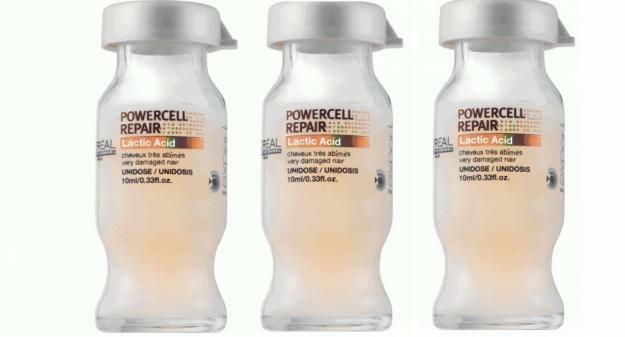 Provides complete renewal and intense strength for chemically-damaged hair. L’Oreal Serie Expert Treatments target the cortex (Zone C) to neutralize weak, negatively-charged keratin bonds that have been broken down by a chemical process. The hair’s internal structure is reinforced with reduced porosity, optimizing a color or smoothing process for radiant shine and long-lasting protection of color. Lactic Acid is able to create saline bonds between the keratin chains exposed in the cortex of damaged hair fibres. AS if transformed, hair is left soft, supple, with a natural-looking shine. 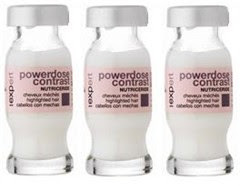 L’oreal Serie Expert Powerdose Contrast is a treatment for highlighted hair. Use as a post-highlight repair treatment. This post-highlight repair treatment carefully targets each highlighted fibre to protect and maintain the hair’s natural condition from within. It also helps to maintain the brightness and intensity of highlights in between highlight services. Highlights are transformed, smoothed and hair easy to detangle. Highlights really are treated and the hair is left light and radiant. Selectively targets sensitized, highlighted hair to revitalize and accentuate its illumination against the rest of the hair. Powerdose treatments target the cuticle and hair’s surface (Zones B & A) with professional concentrations of Bio-Mimetic Ceramide coupled with dedicated technologies for specific haircare needs. These treatments instantaneously provide deep condition at the hair’s cuticle and surface areas for intense shine. Everything is for sale! Support me.